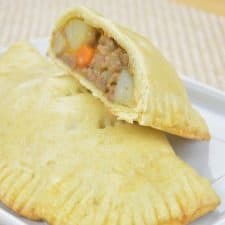 igerian Meat pie is light and slightly Flaky and it's stuffed with well seasoned Ground Beef (minced Beef), Potatoes and carrots. Bake at 350 degrees Fahrenheit for 20 to 30 minutes or till golden Brown. There you have your fresh Nigerian meat pie. Serve with a cup of hot Tea for Morning breakfast or a chill drink for afternoon or evening snack. Enjoy! Some people like their meat pie spicy, so feel free to add any hot pepper of your choice to your filling. I used a combination of Margarine and Butter for this recipe in order to achieve a richer and a little more flakier Meat pie but you can use only Margarine if you choose to, it works very well. It's not advisable to use only Butter for the Nigerian Meat pie, it will be way too flaky. Watch out for your oven temperature. The time on this recipe is what works in my own oven, however, keep an eye on your pies to avoid underbaking or overbaking the pies.